The word ‘nice’ itself is a good example of a nice adjective. It’s nondescript, the opposite of descriptive. If a friend went on vacation and described the Colosseum as ‘nice’, you wouldn’t be any wiser as to how it felt to stand in an ancient, enormous arena. Similarly, if someone described their new friend to you as ‘nice’, you wouldn’t know much about their personality or appearance. Great adjectives do extra work. If the traveler said ‘you’ve got to see it, it was awe-inspiring, really towering’, you’d have a sense of both the feeling the Colosseum evoked and a sense of its scale. 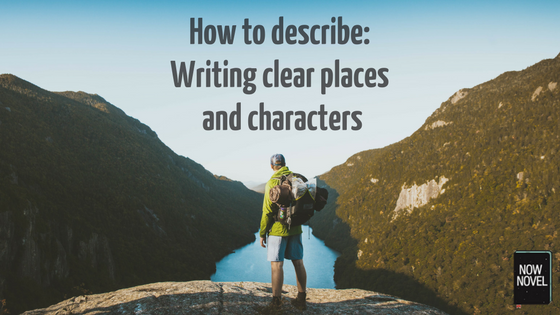 When you’re describing a place or a person, think about the specificity of the describing words you choose. You could say, ‘The man was short’ yet readers might ask themselves ‘how short?’ If you said ‘the man was minute’, this suggests not only that the character is especially small in size but also registers a sense of surprise or shock (given the strength of the descriptive word). One way to get the most out of adjectives is to look up their etymologies. The origins of words often explain additional connotations that we’re maybe dimly aware of but don’t think about. For example, ‘short’ (from Old English via Old High German) means ‘to cut’, with the notion of something cut off. ‘Minute’ (from Latin minutus) means ‘chopped small’. Already a much more visceral image – one of little pieces – underlies this more expressive describing word. Aspiring authors, when introducing characters, often describe people by their eye colour alone. This is ineffective as description for two reasons: Eye colour doesn’t give us any information about a character’s personality (although red eyes may suggest a character has been crying and red irises are a clichéd sign of supernatural malevolence). The second reason why eye colour by itself isn’t effective is that this aspect of physical appearance lacks substantial variety (unless you examine eyes from inches away). Although Tartt includes colour, the emphasis is on what Julian’s eyes say about his personality, not only his appearance. Tartt’s description conveys the character of the house acutely, contrasting the dim of its vastness and uninhabited mood with its splendour (light fittings ‘dripping with prisms’). One of the important functions of description in narration is that it gives us information about the viewpoint character doing the describing. A fearful character entering a crowded house party might describe the noise and action in terms that suggest being overwhelmed. An extrovert, on the other hand, might describe exactly the same scene as exciting and energy-giving. These differences become important in multi-perspective novels where there are multiple characters’ viewpoints. Showing the same scene from different character’s viewpoints would mean making different descriptive choices. As an exercise write a 500-word scene, for example a student protest on a campus. Describe the scene from the viewpoint of one of the active protesters, then describe the same scene from the viewpoint of a jaded academic watching from the sidelines who is skeptical. Think about how each might describe their surrounds and bystanders or participants. 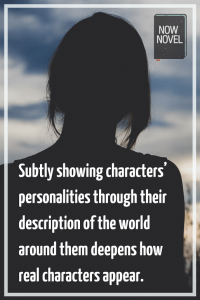 Filtering description via characters’ viewpoints gives you a way to sketch in and develop characters’ personalities and outlooks without explicitly telling the reader what a character thinks or feels. 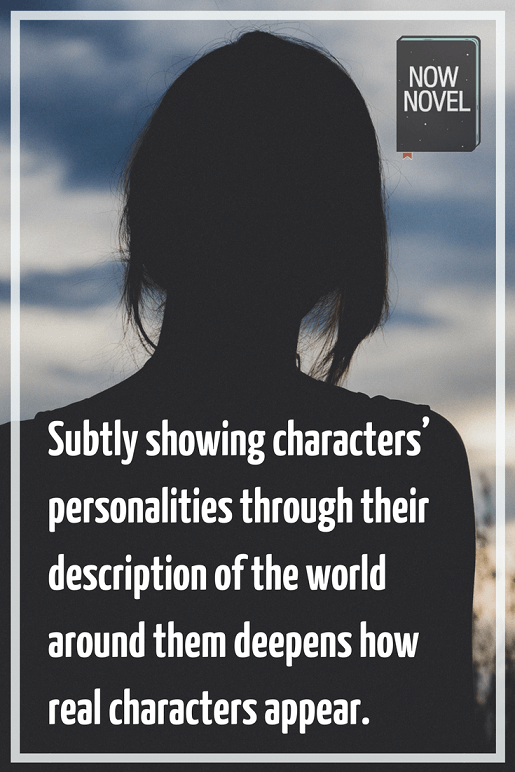 Subtly showing characters’ inner worlds through their description of the world around them deepens how real characters appear. To give your writing descriptive power, build on your descriptions. If a house looks abandoned and neglected from the outside, describe further signs of this abandonment on the interior. The next morning, around ten, I was ironing a shirt in the kitchen when there was another knock at the door. I went into the hall and found Henry standing there. ‘Does that sound like Bunny to you?’ he said quietly. Like his ‘honking’ voice, Bunny’s way of announcing his arrival is described as brash and invasive. Through building character description over time, Tartt shows in Bunny a character who is invasive and unreflective. 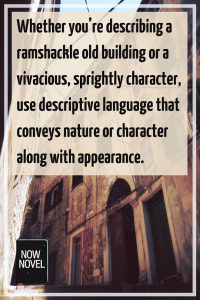 This descriptive building deepens our awareness of the character. The reader can almost predict how Bunny will behave in a given situation. Actively expand the set of descriptive words and synonyms you have in your toolkit. Joyful (from Latin gaudere, ‘to rejoice’). Vivacious (from Latin vivax, ‘lively, vigorous’). Excitable (from Latin excitare, ‘stir up, arouse, awaken, incite’). Glum (from Middle English gloumen, ‘become dark’). Despondent (from Latin despondere, ‘to give up, lose, lose heart, resign, to promise in marriage’). Sorrowful (from Old English sorgful, ‘sad, anxious, careful, distressing, doleful’). Even (from Old English efen, ‘level, equal, like, calm, harmonious’). Stable (from Old French estable, ‘constant, steadfast, unchanging’). Placid (from Latin placidus, ‘pleasing, peaceful, gentle, quiet, calm’). Reactive (from Late Latin, re- ‘back’ + agere, ‘to do, perform’). Vociferous (from Latin vociferari, ‘to shout, yell, cry out’). Fiery (from Middle English fier, ‘fire’). In the darkening evening he slouched towards the town centre, glum, hands thrust in pockets. A passing suit gingerly crossed to the other side of the street at his approach (as though fearful of some encroaching chasm). As an exercise, take all the adjectives in a paragraph of your writing and find their origins in a dictionary. Are there synonyms that are stronger or have more effective connotations or associations? 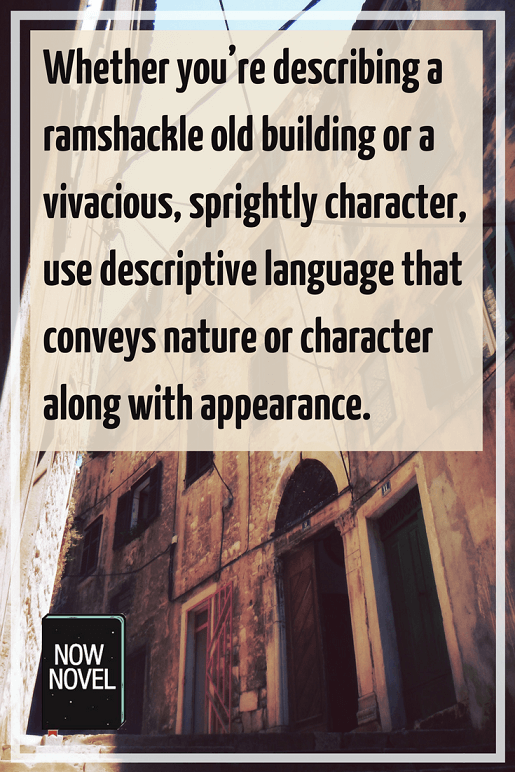 Find more of our best articles on character description on our character writing hub. Learn how to describe characters and places more acutely with the help of Now Novel’s tools and guides, and get feedback on your descriptive writing from the Now Novel community.